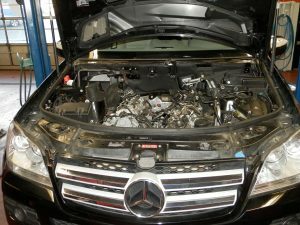 Mercedes Diesel Engine. Turbocharger failure and Oil Cooler leak repairs. At Norlang Auto, nowadays, many of the cars we service and repair are equipped with turbocharged engines. Turbochargers are not only found on high-performance vehicles like Audis, Mercedes or BMW’s. Turbochargers have become commonplace because a turbo is one of the best methods of increasing car horsepower and overall efficiency. With the demand for better fuel mileage and lowers vehicle emission standards for normal everyday cars means that large engines are being replaced with smaller turbocharged engines that are able to match the performance. This increase in performance is due to the turbo’s ability to force additional air into the cylinders which means more fuel is burned and therefore more power is produced. Like most engine parts, turbochargers will eventually fail. At Norlang Auto, our expert turbo technicians carefully diagnose the cause(s) of the failure in order to repair your turbocharger right the first time. We can diagnose, test, any parts of the turbocharging system for all types of engines. If your turbocharged vehicle needs service, our technicians will diagnose and provide you with a repair estimate. If you need to replace your turbocharger, we offer our incredible 2-year, 30,000 km hassle free warranty. We always use premium auto parts that meet or exceed the OEM parts. Many parts we purchase are from the same manufactures the car company used to build the vehicle. We do this to save you money and time. Norlang Auto’s mission is to provide our customers with high-quality products, expert repairs and service, as well as competitive prices. Turbochargers are great in improving engine performance but they have issues that you need to be aware of and able to identify. Check Engine Light is Activated: If your amber engine is activated, it could be due to one of the above issues related to your turbocharger. Loud High-Pitched Noise: If you hear a high-pitched noise, similar to a police siren, then it could be that your turbo has a loose pipe or the turbine blades inside the turbo are failing. Excessive Exhaust Smoke: If your car is producing a great deal of exhaust smoke in different colours (e.g. blue or black), it could be due to a damaged turbo. Increased Oil Consumption: If your car is using/burning more oil than usual, it could mean that you have an oil leak in your turbocharger which could be leaking oil into the engine manifold. Decrease in Power or Acceleration: A loss in power when accelerating could be a sign of a faulty turbocharger. Understanding why your turbocharger failed is important because if you just replace or rebuild your turbocharger without knowing the underlying cause, it is possible to damage your repaired or new turbo again. Carbon Deposits Due to Poor Oil Quality: We always insist that our customers change their oil religiously and use the best synthetic motor oil. This is because if you don’t change your oil as often as you should then the possibility of carbon buildup deposits is much higher. These carbon deposits will likely enter your turbocharger including the loss of lubrication as the oils wear and carry contaminates which cause excess wear and prevent it from working properly. Cracks in Pipes and Faulty Seals: Since a turbocharger works under high pressures, it is quite common for pipes to crack and seals to fail over time. When this happens, gases that travel through your turbo will be lost and thus you will have a loss in power. Foreign Objects Entering Your Turbocharger: Things like dust, tiny stones, leaves or other small objects can get into your turbocharger through the compressor or turbine inlets. Over time, these objects can damage the turbine blades inside your turbocharger which will eventually break and become very inefficient. Not Allowing Your Turbocharger to Cool Down: We advise our customer to allow their turbochargers to cool down after a long drive or if they have been driving at high speeds otherwise, they will cause unwanted stress to the turbocharger. By letting the engine idle for a couple of minutes, your engine supplies fresh oil to your turbocharger as it is spooling down (time taken by the turbine wheel to stop) so it cools down gradually. High Mileage or Used Excessively: Like any other part on your car, with the passage of time or with excessive use it will experience normal wear and tear which will lead to problems. Consequently, if your turbocharger has been used for over 150,000 kilometers, it may be time to replace it. If you would like more information about our turbocharger services, contact our experts at Norlang Auto who can answer all your questions and can conduct a thoroughly professional service of your engine in order to ensure that it is performing as it should be. Please call us at 604-337-1515 or book an appointment online.